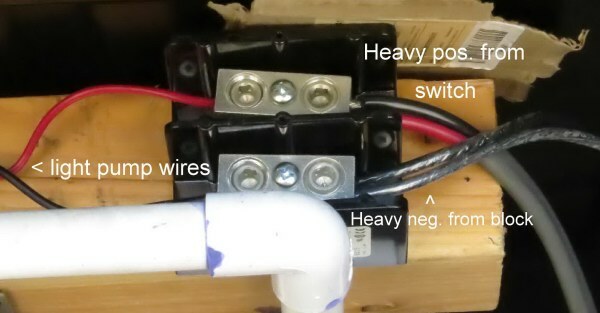 size (gauge) in a low voltage d.c. system. In all candor, I am no math whiz. This is much more important when putting together a low voltage d.c. wiring circuit than with a 120 volt a.c. circuit. there is usually a guide somewhere in the instruction booklet. It will show the gauge size of the extension cord based on the length of the cord. The longer the cord, the heavier the wire size. 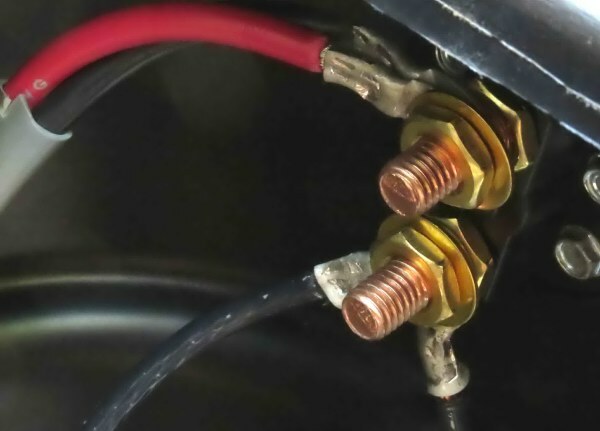 When I had a welding truck, all of my extension cords were 10 gauge. and making them over-amp (smoke). It is even more important in the systems we are working on. A not so quick example. We use biodegradeable laundry detergent and fabric softener. This allows us to reuse the laundry water in our garden and on our landscaping. two plastic 55 gallon drums with a 120 v.a.c. sump pump. We have two pumps, one to push water to the front yard to water the lawn and plants. around a zillion) in the back yard. These pumps run off of two Trojan T-105 six volt batteries in series for 12 volts. They are charged with a solar array. 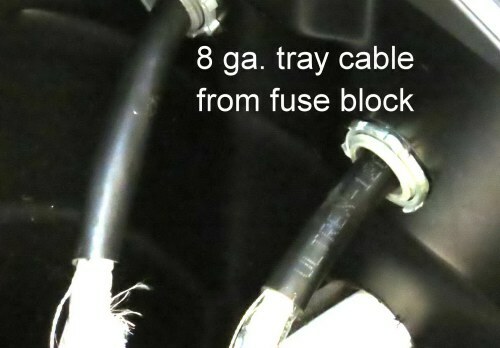 The cables from the fuse block to the batteries is 2 gauge welding cable. enclosure and what looks like 14 or 16 gauge wire on the pump itself. bank is about four feet - no big thing. You can see by this picture the sizes of the wiring. Pump and connections for the front yard. On the other hand, the pump for the backyard needs a wire run of about twenty feet. In this case I dug out some 8 gauge two conductor tray cable. I had enough to make two runs to feed the back pump to prevent a damaging voltage drop when the pump was started. Low voltage pumps can draw 100 to 200 percent over their name plate amp rating just to start. In a low battery voltage condition, the pump can over-amp which will cause over-heating and ruin the pump. You can see the light gauge wire coming from the pump into the left side of the feed through splicer block. 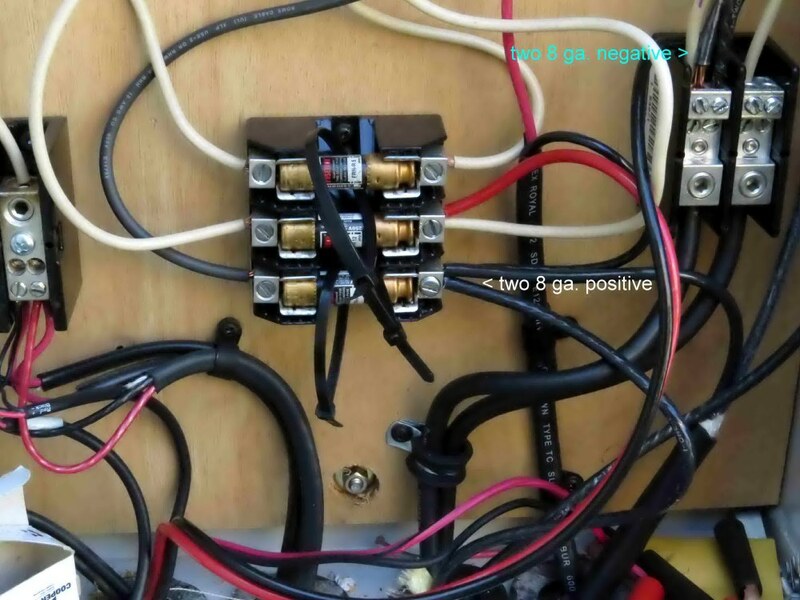 On the right side are two positive 8 gauge wires coming from the switch and two negative 8 gauge wires coming the battery. The black and red wires in the gray jacket are a piece of marine cable from the cut-off wire pile. I use what I can find. 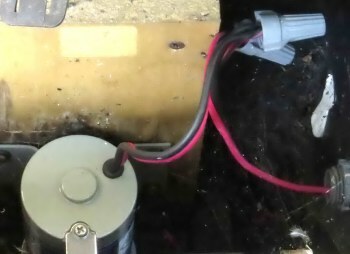 This battery system also powers up a 16" 12 volt d.c. venturi attic fan. It is a long wire run but the amp draw is very low. Like plumbing, you only have so much pressure to go around.